September Colorado River Update: Save The Colorado Is FRONT PAGE NEWS! There’s been a flurry of news over the last month about the Colorado River and we’ve been right in the middle of it! The bad news is that drought, climate change, and political chaos swirl throughout the Southwest U.S. and in every newspaper in the region reporting on the Colorado River. Save The Colorado’s position, policies, and actions are the leading edge of the change that needs to happen to protect the Colorado River. Your support over the last 12 months is what helped us define and push this edge exactly where it needs to be. Thank you for your support for Save The Colorado! First, in Colorado, our work to stop the proposed “Windy Gap Firming Project” is going well. Along with 5 co-plaintiffs, we led and filed the lawsuit in October of 2017 against the project, and since then the applicant has officially “delayed” the project pending the lawsuit proceeding (see Greeley Tribune article here) . The project would be the first new consequential dam and diversion in the Colorado River system in the last 40 years proposing to drain a new ~9 billion gallons of water directly out of the Upper Colorado River every year. Our work was highlighted in several newspapers when we filed the lawsuit, and when the project was delayed. Second, also in Colorado, we are fully geared up to fight the Moffat Collection System Project – the massive Gross Dam expansion in Boulder County, Colorado. 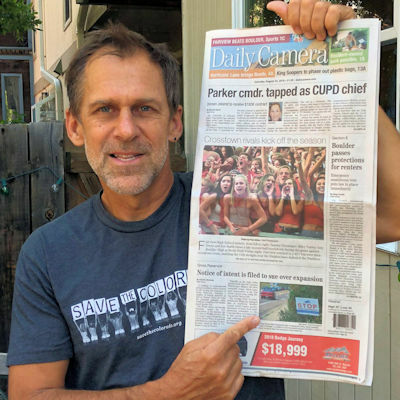 In September, we filed a “60 day notice of intent to sue” (see Boulder Daily Camera article here) under the Endangered Species Act, and we are preparing more complaints under the National Environmental Policy Act and the Clean Water Act that the federal government must respond to. Third, in Utah, we continue to lock arms with colleagues against the Lake Powell Pipeline, a large proposed diversion directly out of the Colorado River. We just got some good news from the Federal Energy Regulatory Commission which notified the State of Utah that the project would require a full Environmental Impact Statement (see St. George News article here) review from another agency, in addition to FERC’s hydropower license. This decision will likely stall the project for years and help us fight to stop it. Finally, our long-term goal of draining Lake Powell and tearing down Glen Canyon Dam continues to gain traction. 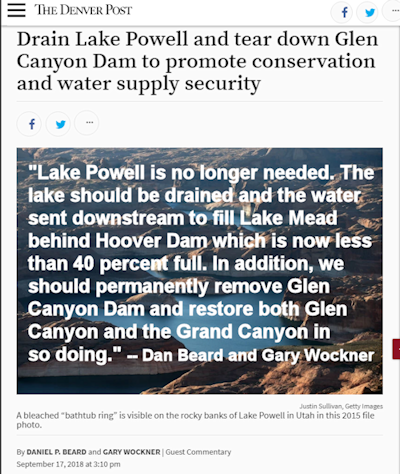 Scientists and the media have all started pushing the idea forward, and last week, Dan Beard and I published an op-ed in the Denver Post titled, “Drain Lake Powell and Tear Down Glen Canyon Dam To Promote Conservation and Water Supply Security” (see Denver Post article here). Dan Beard is on our board of directors and is a former Commissioner of the U.S. Bureau of Reclamation. We also continue to investigate legal opportunities to push the federal agencies in our direction. We say it all the time, but it always needs to be repeated: It’s simply insane to be further damming and draining the Colorado River. We’ve held firm to that policy over the last five years, and our actions back it up with the resources you contribute to us. Our mission is clear, our actions are direct, and we have precise measures of our work and success. What will October bring? More work from us and more progress in our efforts to stop proposed new dams and diversions on the Colorado River! Thank you for supporting Save The Colorado! 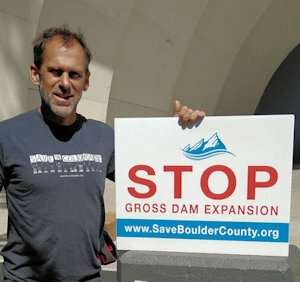 Colorado River Update: Feds Give Permit To Big New Dam; We Fight Against It!